Would you…go back to high school? Attend the same classes year after year, going through the pomp and circumstance of one graduation after another, until you found the perfect date to take to prom? Would you…spend your days moping and brooding, finding your only joy in a game of baseball on a stormy day? Or would you…do something else? Vampires Don’t Sparkle! 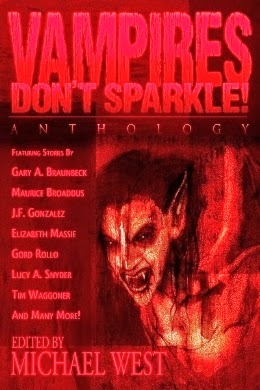 Is an anthology of, you guessed it, vampire stories. But not just any vampires, the tried and true monsters of the night that came before the new good guy version that have popped up in a lot of paranormal romance. Well, you won’t find any of the good vampire variety in this collection. If you like horror, then this is an entertaining read that I’m sure you will enjoy. The collection itself contains about fifteen short stories from all different authors. In addition, before each story, you're given a little background on the author, including recent publications and vampire stories they personally enjoyed. The stories themselves were well written and entertaining. They range from the slightly comical version to the downright eerie, but they were all quick reads. I found that I would pick a story right before bed and finish it in that sitting. Maybe not the best time to read horror but who needs sleep. Anyway, I have to admit that a couple of the stories were soooo good that I was sorry that they ended. I found myself wondering What happens next? Are they really leaving me there? Of course, there were a couple that were just a little too weird for my taste, but all in all, I enjoyed the book. Another thing I have to mention is that a part of the proceeds from the sale of the book is being donated to the American Cancer Society. I must say that I alone made me want to buy the book. Labels: anthology, Horror, Lisa A, Michael West, Seventh Star Press, short stories, vampires, Vampires Don't Sparkle!